Borin Van Loon: Say "Cheese!" 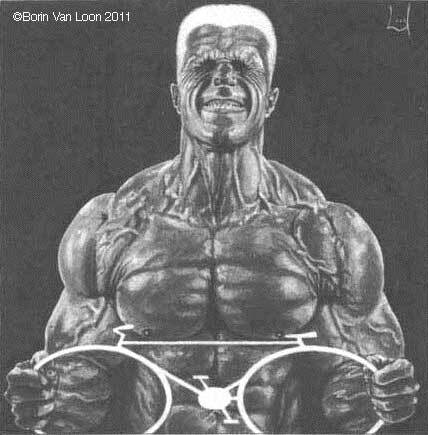 This is one of several pieces created in the eighties based on imagery in 'musclebound' body-building magazines. I was always a little furtive when poring over these colourful, gamey images. As a vegetarian of long standing, I felt a little as if I'd been caught looking at pictures of prime beefsteak. I feel amused and appalled by these specimens in equal measure. There is a morbid fascination in the increase in girth and visibility of the surface blood vessels required to carry greater volumes of blood to the overdeveloped musculature. This thickening resembles roots of trees burrowing and writhing under the skin. Also, I'm a cyclist. The incongruity was carried over to the following, larger scale piece (in a similar medium) to contrast gleaming metal with oiled flesh. 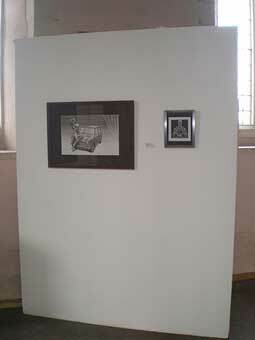 Musclecar and Musclebike on show at St Mary-At-Key, Ipswich in the Key Arts Members' Exhibition, March 2010.